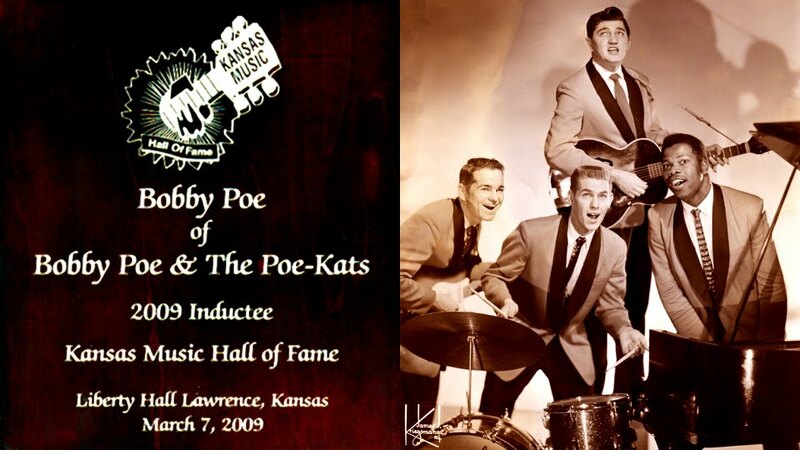 Bobby Poe Hosts This Grand Grove Opry Show From 1999! Check out the official website of Kansoma Music Corp, which was founded by Bobby Poe, Sr. in 1957. Copyrights include music by Bobby Poe and The Poe Kats, Big Al Downing, Fats Domino, The Chartbusters, The British Walkers and many more! In December of 1955, there was a Christmas Party at the local nightclub The Casa Del. The club had a three piece Black Jazz band and after a few beers one of my co-workers bet me $20.00 that I didn't have the nerve to sing a song with the band. Twenty dollars in 1955 was a lot of money. So I took the bet. I asked the band to play "Love Me Tender" and of course they had never heard of it. I told them I'd sing it acappella and they could fill it as best they could. I sang the song and to my surprise, I got a standing ovation. The nightclub owner asked if I had a band. I said "No." He said, "Get one and you got a job." This was my entry into show business. I went in search of musicians, visiting all the area dives and beer joints. The going rate for local musicians was $4.00 per night. Since I had a high paying day job, I picked the three best musicians I could find and offered them $8.00 per gig. We went to work at our local nightclub as promised by the owner. Since we were the first band to play Rock N' Roll in the area, needless to say, we became a local sensation. One Saturday night on the way to the club for a gig, I had the radio on and I heard a young fellow singing "Blueberry Hill" at the local movie theater talent contest. I was blown away as he sounded just like Fats Domino. That young Black man was none other than sixteen year old Big Al Downing. I hired Big Al immediately, with him covering Fats Domino and Little Richard songs and me doing Elvis and Jerry Lee Lewis. We added Joe Brawley on drums, and with sixteen year old guitarist Vernon Sandusky and myself doing The Everly Brothers, we could play all of the hitmakers of the day and had the hottest band in the Southwest... ...CLICK HERE to read more!